We love playing with LOGO What am I? so we are delighted with the new app launched this morning. Following the huge success of the LOGO series of family picture board games, the in-house creative team at Drumond Park has now come up with a brilliant, free LOGO app! As you work your way through each level of the games you can check progress on the levels screen, where successfully completed levels are highlighted in green alongside your best recorded time. Incomplete levels are in red – and you can also go back and try already completed levels again to improve your scores, at any time. The seven question types offer an exciting array of challenges with each round – and in every case, you type the answer from the letters appearing at the bottom of the screen before the timer runs out. For Reveal (left), you rub the screen with a finger to gradually expose the image hidden beneath; you watch the screen with Blur as a well-known image slowly comes into focus; and in Tilt it’s a simple tilt of the screen to move the circle around – to reveal an image hidden beneath. Grid allows you to select a square from the grid to reveal part of an image. Extra squares can be revealed, but there is a 10 second penalty for each. 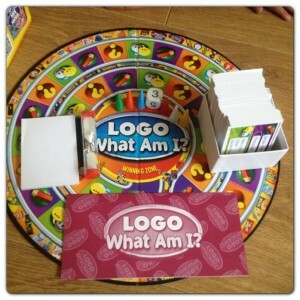 With Shape you try to guess an image from just its outline before the timer runs out; Trivia allows you to select the correct answer from the multiple choices given; and finally, Colour presents you with a black and white image of a well-known logo or packaging, with part of the design flashing grey. Here, you need to correctly identify the colour of the flashing part from the palette below. ‘The official LOGO board game app’, for both iPhone and iPad devices, is on the iTunes App Store list, completely FREE until 31st December 2013.